Graham was to become the founder father of what is now known as Hampton Hill Backgammon Club, but is more accurately, and certainly geographically, Twickenham. We were slightly nomadic in our early days, playing at peoples’ houses, Hampton Wick Royal Cricket Club, and a number of local pubs, before settling at The Roebuck in Hampton Hill. The Roebuck is a pub of tremendous character, but after a year we realised that we were outgrowing our surroundings and have recently relocated to a wonderful, friendly and spacious new venue; Brouge in Twickenham. 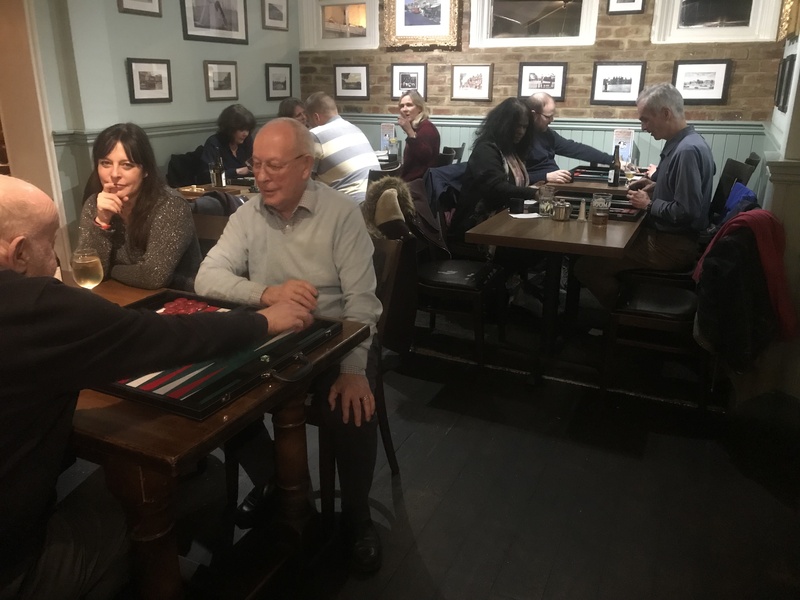 We meet every Wednesday evening from 7pm until 11pm and in addition we have an hour of Backgammon discussion, debate and learning, hosted by Ken Gibson starting at 6pm: everyone is welcome. For much of the early months, it was only Graham, Ken and a charming German lady, Monika that turned up each week. In all honesty, if it hadn’t been for Monika’s persistent attendance, unyielding enthusiasm and appetite for learning, it would have all ended very quickly and without ceremony. Thankfully that early perseverance paid off and our numbers are now consistently healthy and growing weekly. We were recently awarded a generous grant from the UK Backgammon Federation which allowed us to purchase two new tournament sized boards for everyone to use. 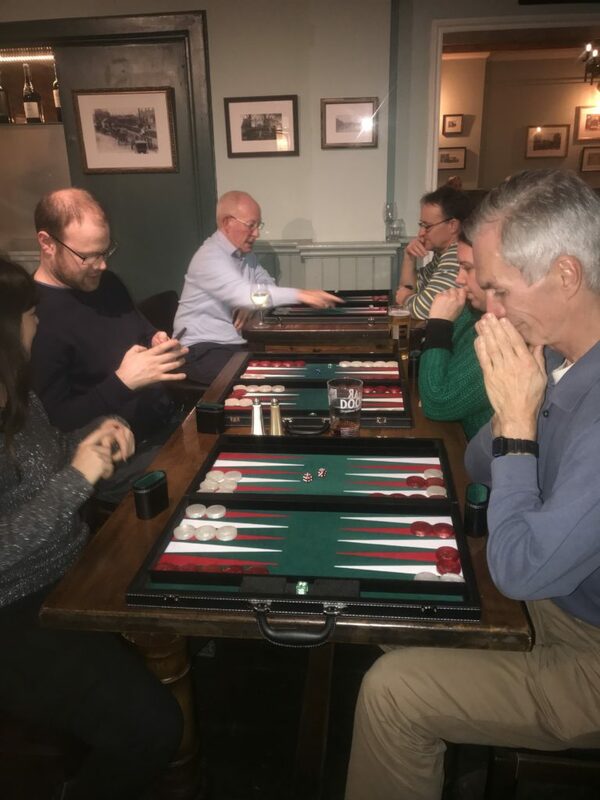 Because many clubs already catered for experienced players looking for structured tournaments with prize money and ratings, our ethos was always to embrace the social elements of Backgammon. We aspire to nurture players who are familiar with the game and to open up to them the many aspects of Backgammon that come with greater knowledge of its intricacies. Newcomers are also welcome and we take time out to guide them through the basics and set them gently off on their path of discovery. We are proud to boast a near perfect 50/50 split between our gentlemen and lady players. We mostly play one point, unrated matches, but it is important to us all that the group grows organically for the benefit of everyone; so who knows which formats lie ahead. Our values will always remain consistent, however and our motto is: ‘join us for an evening and stay with us for years’.